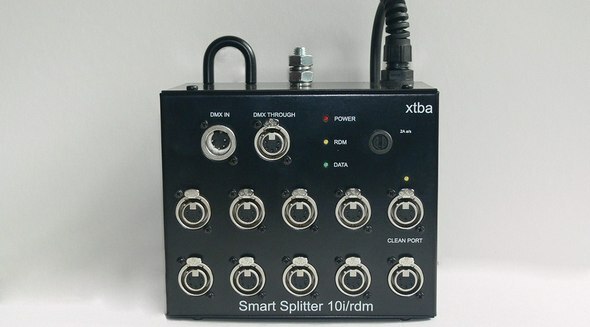 The XTBA Smart Splitter 10i/RDM – Rig Mount is a one in ten out (with loop through) DMX/RDM splitter. Designed for truss or bar mounting. It provides full RDM functionality for devices connected to its outputs. The ten outputs are fully opto isolated and rebuffered. As well as being a standard DMX splitter the 10i/RDM is a fully functional RDM splitter allowing the distribution of RDM requests and responses from its 10 outputs and input. A potential problem with RDM is that any short or overload on any responder can cause the entire RDM system to fail. The 10i/RDM will monitor the ten outputs and block any shorted or overloaded outputs thus protecting the network. The 10i RDM monitors all RDM traffic and will block incorrectly formatted request messages. As well as distributing RDM traffic the 10i/RDM will function as a RDM device itself. So it is discoverable and can have its personality set, labels changed, comms status checked and supply information about itself. Displays for Power and Overload via the red LED. RDM data via the yellow LED and data in and input error via the green LED. The 10i/RDM has six personalities set via RDM. The splitter will retransmit the last valid frame in the event of data loss on the input. RDM requests and responses will still be passed through. The splitter will strip out any RDM data from the input data and only pass DMX level information. As above but will hold the last valid frame on the input. Output ten will remove any RDM messages but pass through normal DMX. So devices that may misunderstand RDM messages as level information can be connected.